Morocco’s Mojo Moving Financial Markets! Foreign Direct Investment (FDI) increased by more than 23 percent in 2013, to more than $5 billion, with the largest deals in food processing. FDI increased for the third year in a row, mirroring the recovery in Europe with French FDI up 20 percent. 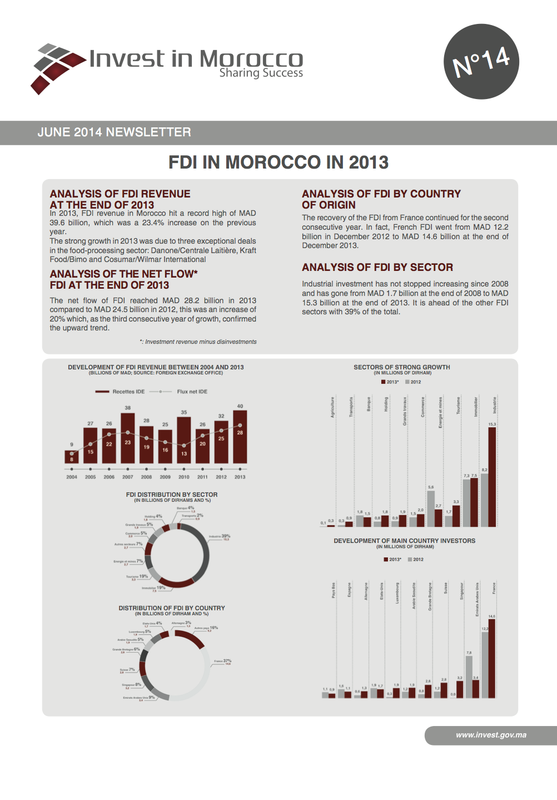 Industrial investments in 2013 represented 39 percent of FDI. AMDI’s June 2014 Newsletter. Click to view larger. The newsletter cited other sources with good economic news ranging from Foreign Policy’s Baseline Profitability Index (BPI), which ranked Morocco third in the Arab world, and the only Maghreb country listed; to the World Economic Forum’s “The Global Enabling Trade Report 2014,” in which Morocco improved by 21 places. 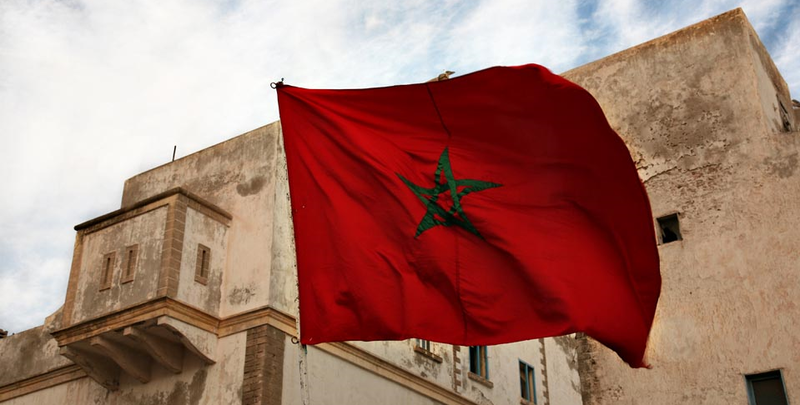 AON, a global insurance broker and expert in risk management gave Morocco the best mark in the region for business climate, and Morocco was only one of two Africa countries to make AON’s list in its Global Risk Management Survey. It is no surprise, given its stability and strong investments in the sector, that Morocco was named as the number one country in North Africa in terms of the importance of tourism by the World Travel and Tourism Council (WTTC) in its Travel and Tourism Economic Impact 2014 report. And the financial sector also received accolades at the 2014 Africa CEO Forum, when Attijariwafa Bank was named African Bank of the Year 2014. The supply chain for the automotive industry continued its expansion as Saint Gobain announced a new $18 million windshield glass and glazing factory in the Kenitra Atlantic Free Zone, joining Lear Corporation’s launch of its fourth factory for electrical wiring that will employ upwards of 1700 people; and Yazaki’s is opening its third plant for automobile wiring targeting 3000 jobs. The balanced growth of the industrial sector is demonstrated by the $26 million steel sheet processing and preparation plan being constructed by the Spanish firm Bamesa with a capacity of 100,000 tons a year. The French firm LH Aviation, noted for its light aircraft, opened its first manufacturing facility valued at some $20 million; and Elephant Vert announced its plans for two fertilizer and pesticide factories with an investment of $58 million. In the IT sector, Lacamobile, the world leader in low cost call centers, is setting up its first facility in Morocco that will employ 1000 people; while Ingenico, tops globally in electronic payment solutions, has chosen Morocco as its headquarters for serving African clients. The rapidly developing new town of Zenata scored two coups in 2014: the announcement of the first IKEA store in Morocco located in its city commercial center; and a planned shopping center, whose manager will be Sonae Sierra, a Portuguese firm that will be investing more than $15 million in its first foray into Morocco. It is not surprising that AMDI focuses on the positives of investing in Morocco; there can be no understating how that country’s success is critical to the region’s economic health. Morocco is making a positive contribution to its own development and that of its neighbors by creating value centers for economic activity that serve regional and international markets. Its achievements to date would not be possible if companies did not believe in the stability and vision of the country and the efforts made by the government and private sector to be business-friendly and reliable partners. The companies are profitable, valued jobs are being created, and Morocco is demonstrating its well-earned regional role as a leader in economic growth.